The average traffic control company raises some worrisome questions. Are they good at permitting? What’s their availability? What about certification? And prices? Roadway Construction Services (RCS) eliminates these questions. Because we’ve demonstrated our mettle in every important category. You might say we’re the worry-free traffic control company specializing in Southern California. You demand proof? OK. We’ll start with traffic control permitting. Let’s face it. You’re not setting a single toe on the work site without proper permits. That means satisfying an army of city officials and business leaders. Good thing RCS knows the territory. As a result, we routinely cut through red tape and secure permits well in advance of start dates. Big relief, eh? You’ll also be relieved to know we’re available 24/7/365. That includes round the clock emergency on-call service. Whether dealing with a burst water main, traffic accidents, power outage, or any other urgent situation, RCS helps cities respond with lighting speed, day or night. Rest … what’s that? OK, we’re fast and we’re available. But can we walk the walk? No worries there. Rarely do traffic control companies boast more competent crews than those of RCS. Our team is acclaimed throughout the industry. And not just for their consummate efficiency. RCS crews combine supreme competence with an unflagging commitment to safety. They have to. Every member of our team is thrown into the most rigorous skills and safety training regimen possible. Those who get through it bear the industry’s most prestigious certifications. Example, the ATSSA designation earned by our traffic control technicians and supervisors. But at RCS, once is not enough. Through ongoing training, every member of our team stays in tune with the very latest safety regulations and requirements. You’re probably expecting a soaring price tag befitting our credentials. Understandable but off- base. Among traffic control companies, we provide the most competitive pricing in Southern California. How does RCS maintain its competitive pricing year after year? Credit the careful planning of our project managers. They cover every contingency, possibility, and detail, cementing these variables into an iron-clad master plan. Conforming to both federal and California state guidelines, these advanced snapshots delineate a precise course for our crews and technicians. Knowing which moves to make, RCS consistently stays on budget and avoids untimely surprises that can rack up extra expenses and compromise the safety of crews, motorists, and pedestrians. Would you like to learn more about our acclaimed traffic control services? Call RCS at (855) 907-7233 or email us for additional information and answers to all of your traffic control questions. 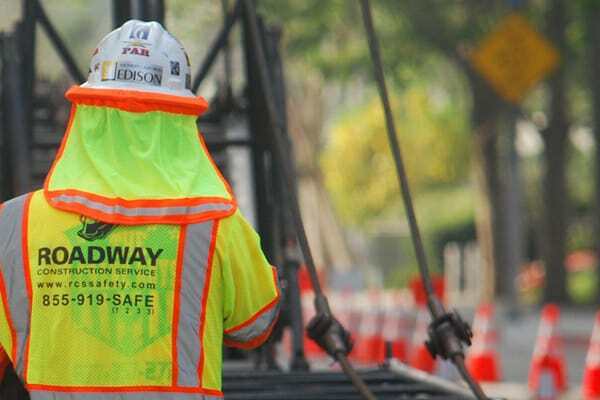 You’ll discover why we set the standard for traffic control companies in Orange County, L.A., and the rest of Southern California.